I am happy to report that as of today I have gone from "writer" to published author. 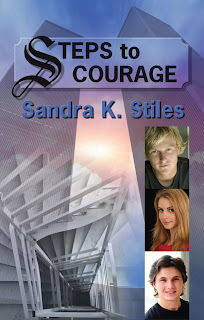 My book Steps to Courage is available on Amazon. Here is an expanded description of my book. this venture by her ex-boyfriend Lucas James. He is hoping to use this not only for his required hours, but to mend the broken relationship with Trina. Mark Jacobs volunteers for the project out of guilt. He has been carrying around the guilt of playing a major role in his parent’s death. He hopes to find a way to forgive himself. They meet at the Twin Towers on 9-11 to divide and conquer. None of them expected terrorists to fly planes into the Towers. Each of them is a survivor of a horrific tragedy from their past and, now they must face escaping the burning towers with all the odds stacked against them. How will they survive this ordeal when each of them feels guilty at having survived in the first place? I am taking advance orders for my book for a limited time. Order from my site and pay no shipping.